Amazon announced in October 2018, that it plans to raise its minimum wage to $US15 per hour for all of its US workers. 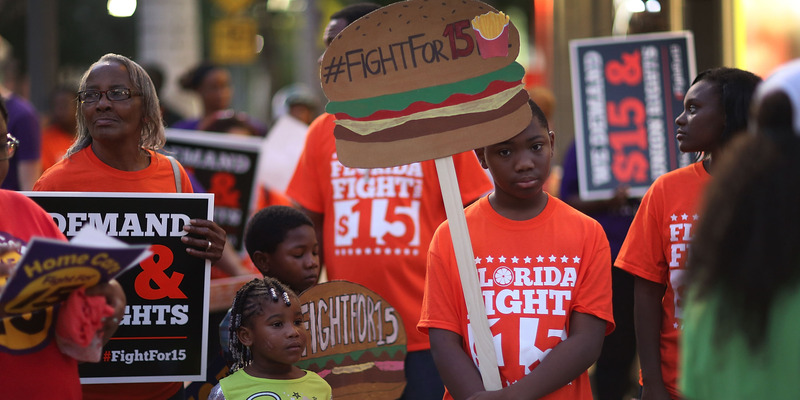 The federal minimum wage in the US is $US7.25 an hour. Using data from the Bureau of Labour Statistics, we looked at how many hourly workers in each state earn the minimum wage or less. Amazon announced in October 2018, that it plans to raise its minimum wage to $US15 per hour for all of its US workers. That’s more than twice the federal minimum wage of $US7.25 per hour. The Bureau of Labour Statistics tracks how many people earned the Federal minimum wage or less in each state in a given year, releasing those results in an annual report on minimum wage earners. That means that these estimates come from Americans’ own self-reported earnings on the survey, rather than from employers or government administrative sources. Both the number and percentage of the hourly work force earning the minimum wage or lower has declined in recent years as the labour market continues to tighten. In 2015, about 2.6 million hourly workers in the US were paid at or below the minimum wage – about 3.3% of the hourly workforce. By 2017, that dropped to 1.8 million workers, or 2.3% of all hourly paid workers. Here’s the percentage of hourly paid workers in each state who earned the federal minimum wage or less in 2017, according to the BLS’ report. 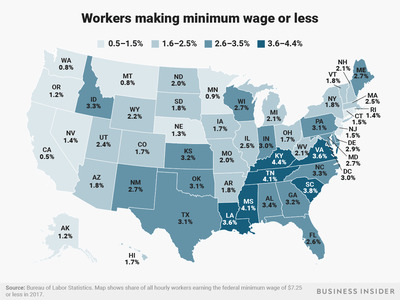 It’s worth noting that many states have their own minimum wages that are set higher than the Federal minimum, and that this is likely a big driver in the variation among the states.